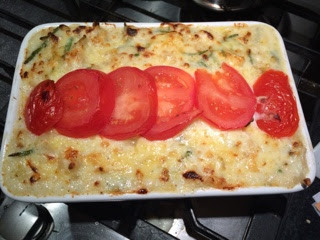 I love Macaroni Cheese and making variations to the recipe. This one I added crab, fennel and herbs to the basic recipe and it was delicious. I also sliced a tomato and put that over the top before sticking it under the grill. Yum! Bring a saucepan of water to the boil. Add the pasta and cook for 3 to 4 mins, drain well. Meanwhile, in a medium saucepan, heat 1 tbsp oil and 1 tbsp of butter over a medium t heat. Add the celery, onion, fennel, garlic, bay leaf, thyme, lemon zest, salt and pepper. Cook for about 6 to 8 mins. Add the crabmeat to the vegetables and season liberally with Old Bay seasoning. Stir to combine, then remove from the heat. In a saucepan, melt 3 tbsp butter and whisk in the flour. Cook for 1 min, then whisk in the milk, a little at a time, and bring to a boil. Season with salt, pepper and nutmeg and cook for a few mins, until the mixture coats the back of a spoon. Add the mustard and the cheddar and gruyere cheese and stir until the cheese has melted. Add the pasta, vegetables and crab to the sauce and transfer the mixture to a large casserole dish. Preheat the grill. Sprinkle the breadcrumbs, parsley and parmesan over the pasta mixture and pop under the grill for 5-10 mins until golden on top.